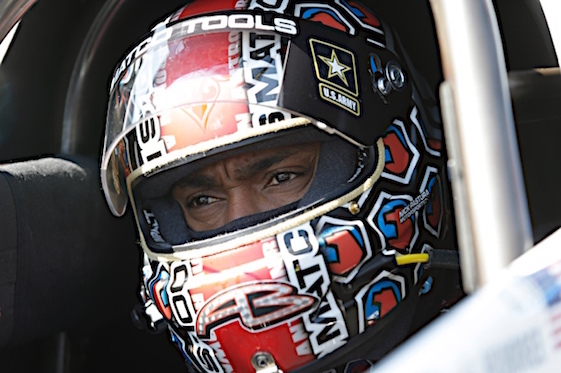 Three-time NHRA Top Fuel world champion Antron Brown recorded a career milestone Sunday with a victory over Don Schumacher Racing teammate Leah Pritchett in the finals of the 31st annual CatSpot NHRA Northwest Nationals. Brown _ who scored his third consecutive victory at Pacific Raceways in Kent, Wash. _ became only the fourth driver in NHRA history to win 50 Top Fuel events with a 1,000-foot run of 3.835–seconds at 322.84 mph. The final margin of victory was 0.0047-seconds, or approximately two feet. Brown’s most recent victory came during this event one year ago. Sunday’s event outside Seattle marked the end of NHRA’s annual summertime three-race Western Swing that also included stops in the Denver, Colo., and Sonoma markets in Northern California. Meanwhile, DSR’s Ron Capps (Funny Car) hoisted his 60th career Wally trophy and Tanner Gray (Pro Stock) also emerged as a winner at the 16th of 24 events on the 2018 NHRA Mello Yello Drag Racing Series schedule. Neither of them, however, was as relieved as the popular Brown. “Our main focus has just been to get better every race and learn this new combination and how to make it work,” Brown said. “We were good in Sonoma, we were good in Denver, we were good in Virginia. We were just losing close races. We used to be on the opposite side and today all of the win lights turned on for our team. The Countdown to the Championship is NHRA’s six-race, season-ending playoff for the top 10 drivers in Top Fuel, Funny Car, Pro Stock and Pro Stock Motorcycle. Brown defeated Shawn Reed, teammate/eight-time world champ Schumacher and point-leader Steve Torrence to reach his 120th career final round. Pritchett advanced to her second final appearance of the Western Swing by defeating Troy Buff, Clay Millican and Mike Salinas. “When we went to the final round against Leah, even after they blew up in the semifinals, we knew we had our work cut out for us,” Brown said. “We just went up there and tried to run the same thing we ran in the semifinals. She crammed it in a little bit there (at the Christmas tree) and I’m just thinking, ‘OK, AB, don’t rush, take a breath.’ Then when that tree came down, I just hit it like I always hit it and we had just enough to squeak it by her. Capps posted a 1,000-foot run of 4.033-seconds at 314.90 mph in his Dodge Charger R/T to beat point-leader Courtney Force and her Chevrolet Camaro SS in the final. Capps, the 2016 world champion from DSR, prevented John Force Racing drivers from sweeping the Western Swing. Capps secured his second win of the season, fourth event victory at Pacific Raceways and that milestone 60th career Wally. “There’s a lot of good solid competition out there,” Capps said. “I’m in the waterbox, and there’s Don Schumacher, and all I’m thinking is, ‘They’re (JFR) going to try and sweep The Swing.’ I was on the bad end of those (two final rounds) in Denver and Sonoma, so more than anything, I wanted to end that for Don. That was in my head, ‘Don’t let John Force sweep The Swing in Funny Car,’ so I’m glad we could put a stop to that. Capps qualified ninth and trailered Jonnie Lindberg, teammate/two-time world champ Matt Hagan and Tim Wilkerson to reach his fifth final this season. Courtney Force defeated Jim Campbell, Shawn Langdon and Tommy Johnson Jr. to advance to her category-best sixth final of the season. Fittingly, it was at Pacific Raceways in 1995 where Capps claimed his first professional win and his only Top Fuel victory to-date. Capps was nostalgic as he recalled a day he considers a crucial turning point in his career. “I won here in 1995. It was on a Tuesday,” Capps said. “I was in an unsponsored car, I borrowed money for a fire suit and Pennzoil was on my suit _ my mom sewed it on. That was a big moment. I’ve been here many times and have been able to win in Funny Car, but that was a fateful day. From what (former team-owner) Don Prudhomme told me, that was the day he started watching me on the track, how I drove, the way I carried myself. That day probably propelled me to the next step of getting a phone call from Don ‘The Snake’ Prudhomme, and from there led me to be able to drive for Don Schumacher. In Pro Stock, Gray covered the traditional quarter-mile in 6.632-seconds at 210.05 mph in his Gray Motorsports Camaro SS to defeat Deric Kramer in the final and become the lone “Factory Hot Rod” driver with four victories this season. The 2017 Auto Club of Southern California Road to the Future Award winner secured his fifth final appearance of 2018 and first at Pacific Raceways. Gray qualified fourth and eliminated Fernando Cuadra, three-time world champion Jason Line and Vincent Nobile to lock in his position in the Countdown playoffs. Two-time world champion Erica Enders, Nobile and No. 1 qualifier/five-time world champ Jeg Coughlin Jr. each joined four-time world champ Greg Anderson by locking into the 2018 Countdown. The regular season will continue at Brainerd International Raceway in Brainerd, Minn., from Aug. 16-19, with the Lucas Oil NHRA Nationals. Top Fuel _1. Antron Brown; 2. Leah Pritchett; 3. Steve Torrence; 4. Mike Salinas; 5. Richie Crampton; 6. Clay Millican; 7. Doug Kalitta; 8. Tony Schumacher; 9. Troy Buff; 10. Scott Palmer; 11. Shawn Reed; 12. Bill Litton; 13. Brittany Force; 14. Jim Maroney; 15. Terry McMillen; 16. Ron Smith. Funny Car _1. Ron Capps; 2. Courtney Force; 3. Tommy Johnson Jr.; 4. Tim Wilkerson; 5. Matt Hagan; 6. Shawn Langdon; 7. J.R. Todd; 8. Robert Hight; 9. Jack Beckman; 10. Jonnie Lindberg; 11. Bob Tasca III; 12. Cruz Pedregon; 13. Gary Densham; 14. John Force; 15. Richard Townsend; 16. Jim Campbell. Pro Stock _1. Tanner Gray; 2. Deric Kramer; 3. Vincent Nobile; 4. Bo Butner; 5. Erica Enders; 6. Jason Line; 7. Jeg Coughlin Jr.; 8. Greg Anderson; 9. Matt Hartford; 10. Drew Skillman; 11. Fernando Cuadra; 12. Chris McGaha; 13. Alex Laughlin; 14. Steve Graham; 15. Alan Prusiensky; 16. Joey Grose. Top Fuel _ Antron Brown, 3.835-seconds, 322.88 mph def. Leah Pritchett, 3.849-seconds, 320.13 mph. Funny Car _ Ron Capps, Dodge Charger, 4.033, 314.90 def. Courtney Force, Chevy Camaro, 4.115, 255.63. Pro Stock _ Tanner Gray, Chevy Camaro, 6.632, 210.05 def. Deric Kramer, Camaro, Foul/Red Light. Top Fuel Harley_ Tii Tharpe, JTR, 6.318, 225.30 def. Mike Scott, Weekend, 6.453, 209.07. Top Alcohol Dragster _ Shawn Cowie, 5.230, 277.26 def. Joey Severance, 5.278, 274.16. Top Alcohol Funny Car _ Chris Marshall, Chevy Camaro, 5.455, 269.19 def. Shane Westerfield, Camaro, 5.510, 269.78. Competition Eliminator _ Brian Hyerstay, Dragster, 8.825, 137.13 def. Ralph Van Paepeghem, Bantam Roadster, 7.322, 180.43. Super Stock _ Justin Lamb, Chevy Cobalt, 8.519, 158.82 def. Kory Alby, Chevelle, 11.266, 110.95. Stock Eliminator _ Ryan Warter, Pontiac Firebird, 11.763, 109.28 def. Randi Lyn Shipp, Firebird, 10.636, 121.29. Super Comp _ Greg Krause, Dragster, 8.937, 173.81 def. Steve Williams, Dragster, 8.918, 185.97. Super Gas _ Gene Kelly, Chevy Camaro, 9.909, 161.05 def. Robert Naber, Chevy Corvette, 9.905, 162.57. Super Street _ Francesca Giroux, Chevy Camaro, 10.891, 143.09 def. Steve Beggerly, Pontiac Firebird, 10.870, 147.62. Top Sportsman presented by RacingRVs.com _ Bryan LaFlam, Ford Mustang, 6.342, 224.47 def. James Rutherford, Ford Probe, 7.559, 180.65. Top Dragster presented by RacingRVs.com _ Steve Casner, Dragster, 6.699, 198.99 def. Andy Spiegel, Dragster, 6.723, 198.41. FINAL _ Brown, 3.835, 322.88 def. Pritchett, 3.849, 320.13. FINAL _ Capps, 4.033, 314.90 def. C. Force, 4.115, 255.63. FINAL _ Gray, 6.632, 210.05 def. Kramer, Foul/Red Light. Top Fuel_ 1. Steve Torrence, 1,251*; 2. Tony Schumacher, 1,090*; 3. Clay Millican, 1,084*; 4. Leah Pritchett, 1,083*; 5. Doug Kalitta, 995*; 6. Antron Brown, 927; 7. Terry McMillen, 759; 8. Brittany Force, 731; 9. Richie Crampton, 660; 10. Scott Palmer, 649; 11. Mike Salinas, 619; 12. Blake Alexander, 522. Funny Car _ 1. Courtney Force, 1,300*; 2. Ron Capps, 1,146*; 3. Robert Hight, 1,085*; 4. Matt Hagan, 1,064*; 5. Jack Beckman, 999; 6. J.R. Todd, 914; 7. Tommy Johnson Jr., 892; 8. John Force, 824; 9. Shawn Langdon, 736; 10. Bob Tasca III, 691; 11. Tim Wilkerson, 688; 12. Cruz Pedregon, 641; 13. Jonnie Lindberg, 598; 14. Jim Campbell, 451; 15. Del Worsham, 380. Pro Stock _ 1. Greg Anderson, 1,189*; 2. Tanner Gray, 1,147*; 3. Erica Enders, 1,082*; 4. Vincent Nobile, 1,052*; 5. Jeg Coughlin Jr., 1,020*; 6. Chris McGaha, 939; 7. Deric Kramer, 928; 8. Drew Skillman, 927; 9. Jason Line, 913; 10. Bo Butner, 895; 11. Alex Laughlin, 681. Note _ *Denotes clinched berth among the top-10 for the Countdown to the Championship playoffs.